Every morning, the fine folks at Sports Radio Interviews sift through the a.m. drive-time chatter to bring you the best interviews with coaches, players, and personalities across the sports landscape. 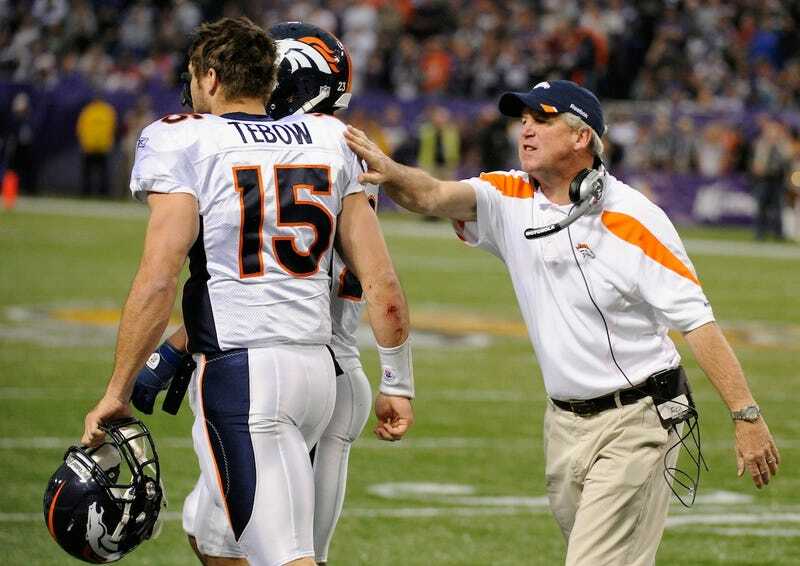 Today: Tebow Time is about quality, not quantity. John Fox joined 102.3 the Ticket in Denver with Les & JoJo to discuss the Denver Broncos winning the AFC West in his first year as head coach, going up against the Pittsburgh Steelers on Sunday where he started his NFL coaching career, the Denver Broncos game plan for the Pittsburgh Steelers, the matchup problems the Pittsburgh Steelers pose for the Denver Broncos offensively/defensively and the Denver Broncos opening up their offensive game plan this week. Congratulations. You are the first ever, first-year coach of the Denver Broncos to win the AFC West. You gotta feel pretty good about that? "I think that was our goal and once we accomplish our goal you get a spot in the playoffs. We are one of the six in the AFC. One of 12 [playoff teams] total left in football. In this playoff season anything can happen." Any irony in going against the Pittsburgh Steelers in the playoffs? You used to coach for Pittsburgh as part of Chuck Noll's tree. How do you feel about playing the Steelers? "I think it comes up. Unfortunately in this profession I have been with a few different teams, so that was my first NFL coaching job and I was very blessed to be with a great Hall of Fame coach with Chuck Noll and the Rooneys, who were owners of a very proud organization and franchise. I learned a lot. I was fortunate to be around some great people there, but on Sunday they will be the enemy." How differently do you approach going into a playoff game compared to the game plan that has been stopped the last few weeks? "Well at the end of the day each one of these games takes its own personality. Every team has got different matchups and different strengths and weaknesses. Without getting into too much detail from a competitive standpoint, we'll have a good plan and I'm sure the Steelers will as well and whoever executes that the best on Sunday will leave victorious." After looking at the tapes of these guys what is the biggest problem that the Steelers pose for you offensively and defensively? "I think offensively they got a Super Bowl winning quarterback. They've got a very skilled fleet of wide receivers led by #17 [Mike] Wallace. They've got a big offensive line that is pretty athletic in protection, but really lean on the run game and the big bodies. They will lean on you. They've got good balance to their attack. Defensively you already mentioned the number one defense in the league at the end of the regular season. They are supposed to be at full strength as far as getting some guys back. They're a salty group. We'll have to just stay on time and not give them long yardage situations to the best of our ability. The kicking game is going to be a big factor because the game is about field position, so that'll be a battle we are trying to win as well. " What is your reaction to the people who say the Broncos should open up their offensive game plan? "I don't really understand what that means unless they say pass it a lot more. If you look at our stats whenever we have thrown it 35 or 45 times it's been very lopsided, so I'd say they gotta stick to what they do because they know that better than they know this." • The 2011 Jets made LaDainian Tomlinson want to retire. • Paul Pierce realizes the Celtics' window is closing. • Mike Munchak says Chris Johnson's holdout is to blame for his disappointing season.